Over the past two decades, a democratic, engaged civic university movement has developed across the United States. A central feature of this movement has been university-community partnerships in which higher education institutions work with organizations and schools in their local community. 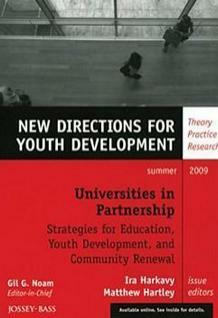 Much of this work has focused on the education and development of young people. Over time, significant change has occurred regarding both the quantity and quality of partnerships, and intriguing models have been developed. Nevertheless, significant challenges remain. The struggle to achieve transformative democratic practice in the face of seemingly intractable obstacles resides at the heart of this volume of New Directions for Youth Development. It requires, among other things, overcoming traditional ivory tower thinking and doing; developing creative, comprehensive approaches; and engaging in long-term, democratic, collaborative work. Five university-community partnerships from across the United States are featured in this volume. Each has been developed over a number of years and has focused on making a genuine difference in the condition of young people and their schools and communities. With case studies from State University of New York, Buffalo, Indiana University-Purdue University Indianapolis, University of Pennsylvania, University of Dayton, Widener University. Each case study demonstrates that university-school-community partnerships have the capacity to build communities, advance democracy, and enhance the quality of life and learning for all Americans, particularly its children.